Today has been so full. I have seen hope, joy, and horrible poverty all in the same day and I am worn out. But I am so full of things I want to share with you. It may take me a while to get it all together so in the mean time - I just wanted to share a few pictures with you. We spent most of the day at one of Compassion's projects visiting chidren. I loved these kids! They were SO precious. I'm pretty sure all 200 kids hugged me and kissed me more than once. The only bad thing today was the fact that I could not communicate with them very well. 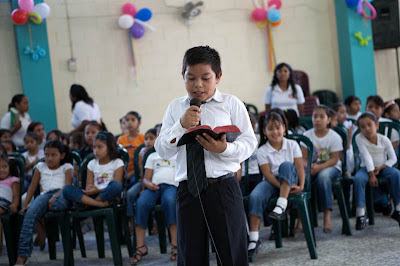 We had a few translators but I wasn't always near one so it was hard when the kids would speak Spanish to me and all I could say is "Mucho bueno?" or "Si!" But the international language of Hug seemed to work every time! Seriously - my love tank was FULL today when I left from all the hugs and smiles I got! This is Marcos. We visited his house this afternoon and I have so much to share about that. I LOVED this little boy. Precious, precious boy - he wants to be a doctor or a pastor. Loved these little girls! The one on the bottom left wanted something to remember me by so I gave her a picture of our family that I brought to share with my sponsored child. You see the love and joy and hope in these children's faces and then we went to see where some of them lived. These children live in a VERY dangerous area of El Salvador with a lot of gang involvement. Violence is a way of life for these kids. Gangs are recruiting children as young as 11 or 12 to kill and steal. My heart breaks for them. But if you could just see the hope and pride that Compassion is giving them. They celebrate "dream" day where they dress up as what they dream to be. Most of these children will tell you they want to be doctors. Compassion is giving them that chance! Someone asked me what % of money actually goes to the children. 83% of money given to Compassion goes straight to help the children. Of course - the other 17% just goes to running the company - the offices all over the world. Charity Watch dog is an organization that checks charities and Compassion is the only U.S. company who has recieved the highest ratings for the last 7 years. We saw file cabinets yesterday with the records that blow my mind that are kept on every child and every penny spent. Compassion is the real deal. It is making a difference. Tonight I will share stories of why I believe SO firmly in Compassion. And you can read more here or on Heather's blog, Molly's blog, Keely's blog, Shaun's blog or Patricia's blog. Looks like you are having a great time! Can't wait to read more! I love looking at the pictures and hearing your stories and experiences! I also love that you and Scott get to do this together - how special! Looking forward to hearing more! I peeked at your Mom's blog today to get my Harper fix, and she's looking adorable as ever and seems to be having a fabulous time! :) Take care! Thank you so much for sharing and for what you are doing! My mom took us to Ecuador when we were little because it is where she is from and the impoverished children there just broke my heart. 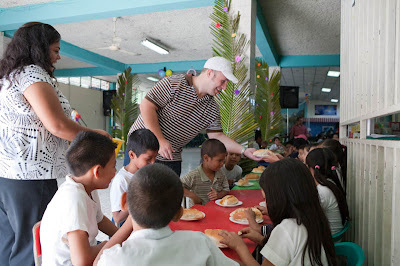 I hope to one day help them like the children you are helping in El Salvador. Such an awesome cause! Those kids seem so appreciative. Love seeing pictures, enjoy the rest of your mission! Great post. You can tell the kids really loved meeting you. Kids know the real deal when they see it. Compassion looks like they are doing a good job. The kids are clean, nicely dressed and look well-fed. Good to know where the money is going, and it's obvious by these pictures. How is your eye doing? Hope you don't have to cut your trip short. Have you stopped crying? Do you need an emergency package of Kleenex sent to you? Have a great trip, and keep the good news coming! I LOVE the photos and I'm so glad ya'll are having so much fun! Touching pictures. I know you are having a wonderful time. I can't wait to do a mission trip one day! May God pour His blessings out upon you all this week!!! Thank you soooo much for sharing! I really enjoy hearing about your Mission Trip and those children are precious! God is SO good! What a wonderful ministry. Thank YOU for going on this journey FOR ME. Great photos and you have such a heart for sharing...I'm reading every post. Although you're not going to be at ES778, I'm able to visualize it through these pictures. Chills Kelly - this post game me chills! Thank-you for sharing your journey with us! I love reading about your trip and experience! I also love the pictures! Keep them all coming...Can't ready more about your journey! Compassion is such a great organization! I am glad that your love tank is full!! May God continue to bless your trip! I sponsor a child from Haiti...and I LOVE It!! I love HER!! I have had helped her for over 5 years now! I hope I get to meet her one day. The boy that is like my son who was a missionary there for 5 years with his family told me about the violence there and they were robbed and threatened so many times and it breaks my heart that these precious children have to live in such a dangerous place. Praying God's protection over these precious children! I have had a little boy from the Philippines about 5 years now. I had one for a couple of years before that, but his parents had to take him out of the program, so I got John Dave. I just signed up for another child, a girl in Africa, a few weeks ago. Less than 2 weeks after I mailed in the request, my husband found out his paper mill is closing Dec. 26th. This is the second closure for us in 6 1/2 years--- the first was after 27 years with them and he transferred to this mill in 2003. Please pray that he will find something so that I can continue sponsoring my Compassion children. Thank you. I love seeing the photos and hearing the stories. What you're doing is so awesome! We're so blessed here, aren't we? This is just amazing! God is truly working all over the world! I am very interested in Compassion, but had never heard of it before you. I have always wanted to sponser a child. As soon as I graduate college I plan to do that. Thank you for posting all about Compassion because it seems like a wonderful agency that would be perfect for me to donate to in the near future. Thanks for taking us on the trip with you! Thanks for being willing to take the step of faith to make the trip! I enjoy following these trips so much and I am so looking forward to hearing about it all from your perspective. Praying for you all as you travel! I've been reading your blog since Harper was born, but don't think I've ever commented. 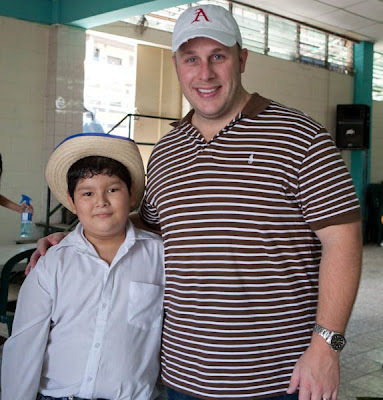 It dawned on me tonight that our sponsored child (we work with World Vision) is also in El Salvador. It helps to see your pix as I only get to see little Ena once a year in the photo we receive. I love, too, knowing that so much is being done to help the most vulnerable and innocent of our world. Don't you just wish you could scoop them all up and take them home? Awwwww...what SWEET pictures! I am praying for you every day! I just realized you're there with my friend Heather!!! Too cool! We went to college together! :) I am about to hop on a plane and leave Ukraine and head back to civilization! YAY! Frank is staying here to bring Kellsey home. I am going home to my babies! Miss them SO much! Soon our family will be complete! Praying for you!!! What a blessing! Sounds like an incredible journey so far! Praying for you, Scott and entire team. Missions will so change your heart! The smiles on their faces are just priceless!!! Thanks for posting! This just looks wonderful!!!!!! Wish I was there!!!!!! Thank you for sharing a glimpse of your trip. Tonight my husband and I chose a little girl from El Salvador to sponsor. We look forward to sharing this ministry through the years with our 15-month-old daughter. God bless you as you minister to these precious little ones! Thank you for sharing all of your pictures! Much prayer is with you and your group this week. May many give their hearts to Jesus. Kelly, I have been so touched by reading your post about the trip. What an amazing opportunity and organization! Awesome, awesome pics! So touching and what an incredible way of capturing Christ's love in a picture! You & Scott are in my prayers! This is a wonderful thing that you're doing... Some day I hope to be in a position to be able to sponsor a child but since we're trying to pay down debt so we can either adopt a child or do more intensive fertility treatments it's not in the cards for us to do right now.... Thank you for sharing this journey with us. Love the pics of you with the girls. Just beautiful! You can see the joy in their faces and yours!!! Of course the pictures just tug at my heart and I cried looking at them! Praying for all of you Kelly! You are being Jesus with skin on to them. Press in and press on!!! 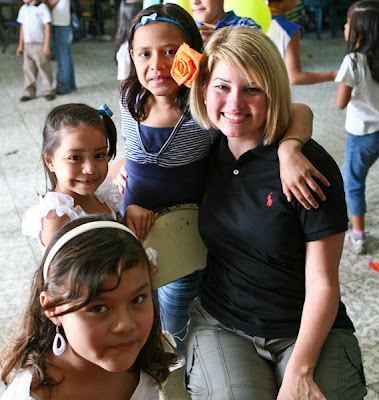 Kelly, your posts are bringinge back to all the time I spent in Honduras ... I couldn't hug those kids enought when I left. Enjoy the rest of your trip!! Thanks for sharing! You are great, and I would love to know the increase in children adopted just based on this trip alone. Meaning you and the other bloggers. I have been keeping up with their blogs as well. Hope that is something that is shared. Those kids look so happy to hug your neck, what a wonderful thing you are doing. This makes me so happy! Thanks so much for sharing Kelly and introducing me to Compassion. I just signed up tonight to sponsor a child in Africa and I can't tell you how happy it makes me! I am so excited! Thank you for all you do and for your witness for the Lord. Praying for you this week. How amazing....thank you for sharing your wonderful experience with us!! After reading everything you have posted these last few days, I am going to sponsor a child. I hope that by sharing the story of whatever child we get, my children will realize how blessed they are. Praying for you and your team! "Charity Watch dog is an organization that checks charities and Compassion is the only U.S. company who has recieved the highest ratings for the last 7 years." Where did you hear this? Honestly, I don't believe it. There are several US charities that have overhead expenses half of Compassion's, sending 93% or more of the donated money to projects. 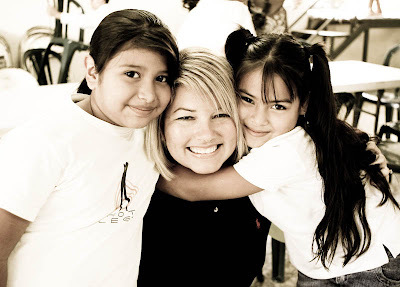 Having sponsored kids through multiple organizations, Compassion strikes me as average for the top tier organizations when it comes to overhead and fundraising expenses.